Christmas in March? It’s a bonus. Home » The Mickey Spirit » Christmas in March? It’s a bonus. Mickey CEO Dean “Santa” Sink announces a team bonus at a biscuit breakfast in March. “Great teams pull together to make great things happen – all year long,” Dean said. “Great companies,” he added, “engage with their employees to achieve 100% customer satisfaction through product and service quality and on-time deliveries. 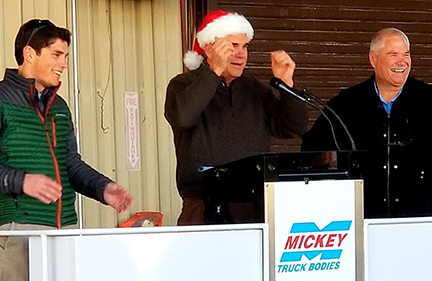 Thank you for making Mickey a great company.” Mickey execs Matt Sink (left) and Carl Mickey helped deliver the good news.